I thought I’d post one of my 10-minute writing exercises. I try to do one every day. Note: This story is unfinished. 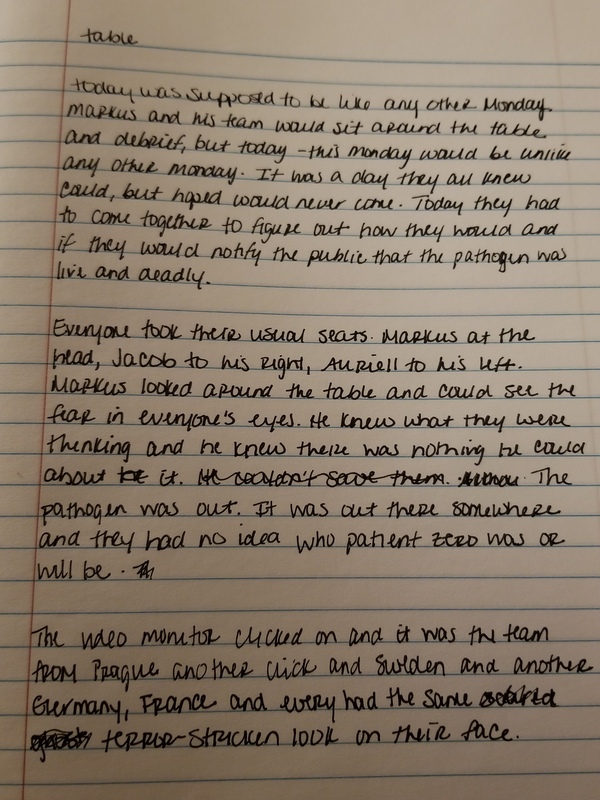 Let me know what you think, if you’d like to see the story finished and/or if you’d like to see more of these writing exercises or short stories. Today was supposed be like any other Monday. Markus and his team would sit around the table and debrief, but today – this Monday would be unlike any other Monday. It was a day they all knew could, but hoped would never come. Today they had to come together to figure out how they would and if they would notify the public that the pathogen was live and deadly. Everyone took their usual seats. Markus at the head, Jacob to his right and Auriell to his left. Markus looked around the table and could see the fear in everyone’s eyes. he knew what the were thinking and he knew there was nothing he could do about it. The pathogen was out. It was out there and they had no idea who patient zero was or will be. The video monitor clicked on and it was the team from Prague, another click and Sweden, and another Germany, France and everyone had the same terror-stricken look on their face.